Inflammation associated with immune complexes in the capillaries and small blood vessels is part of the pathological changes of many of the conditions described above. 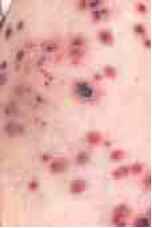 The term vasculitis is also used clinically to describe a variable clinical picture with red macules and papules and with necrosis and bruising in severe cases. In children purpura is more prominent and these cases are classified as Henoch-Schonlein purpura. The legs and arms are usually affected. 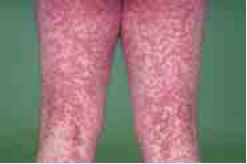 Skin signs are preceded by malaise and fever with arthropathy and there may be associated urticaria. 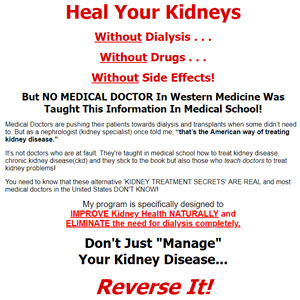 As a high proportion of cases are associated with systemic lesions, it is essential to check for renal, skeletal, gastrointestinal, and central nervous system disease. In children with Henoch-Schonlein purpura nephritis is common.